It is no secret that I love a sweet citrus scent and Selenite is citrus, but with a twist! Like all of the Savage Alchemy balms the Selenite beard balm has a firm consistency and you will need to use something like a plectrum to scrape some out of the screw top tin. It is a base blend of Shea Butter, Cocoa Butter, Beeswax, Hemp seed oil, Jojoba oil, Argan oil & Sweet Almond oil. The blend is perfectly smooth without a hint of any grainyness and the firm balm doesn’t take long to be worked in the hand ready to apply. I have been happy with the results, it is a nice balm and left my beard feeling softer, it gave a nice hold and so my beard was kept looking good. The scent blend is Sweet Orange, Star Anise & Nutmeg and it works, in fact it’s very nice indeed. It is of course a citrus scent and the Sweet Orange is what you first get and that is then backed up with the spicy Star Anise and the warmth of the Nutmeg. If I was looking to buy and had just read the ingredients in the scent without trying, I think it would have been one that I would have likely passed by. I am not keen on the Star Anise scent that resembles Fennel and Liquorice but it really works well with the sweetness of the orange. 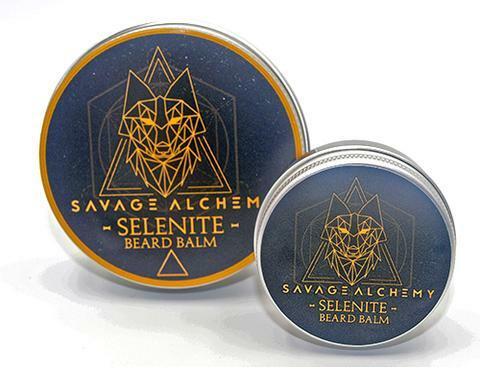 The Savage Alchemy Selenite beard balm is available in two sizes, 30g costs £8.99 and the 60g costs £14.99 from the website. Read my reviews of the Savage Alchemy range here. ← Being stuck indoors doesn’t bother me!